Zippy, Zip, or Riptide Zip, is a purebred Blue Merle Border Collie from Contact Point Border Collies in Fillmore California. He is four years old, and obsessed with Flyball. He holds many Flyball Titles including Top Flight I, II, and III in U-FLI and FD, FDX, FDCH, and FDCH –Silver in NAFA. 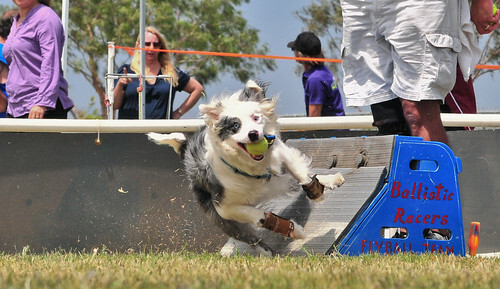 Zippy has been doing flyball for three years and enjoys every minute of action since he has so much energy and drive. He has been in the newspaper and on the News twice for Woofstock. Zippy is a friendly dog who not only loves flyball, but loves to do agility and go swimming as well. He goes to agility and frequents the Dog Spa in Oceanside each weekend. He really enjoys swimming and chasing after those toys, pushing off the wall, and making a quick turn to do another round of chase. When not doing his activities, Zippy enjoys flying over to Catalina, where he goes on long walks and really great golf cart rides around Avalon. Due to his quick speed, and love for flyball racing, Zippy holds up to his name.